Small things turn into big things when they lack attention. Small things, small acts of kindness, can change a person’s outlook on life. Small things make an impact … and deep is the impact this book will make. The protagonist in this story is a lonely, school-aged child, laden with social anxieties. These worries start to eat away at him, expressed chillingly in the pictures by tentacled, demonic creatures. His grades at school are affected, along with his relationship with his family. He has trouble sleeping at night. 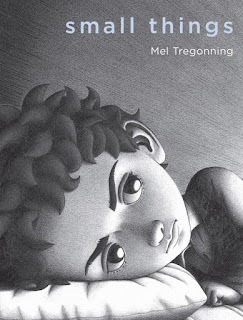 The story is told entirely in vivid, black and white illustrations so expressive that to accompany them with words would do them a disservice. The front cover, showing a close-up of a child’s face consumed with sadness, is stark and confrontational. It is impossible to walk past this title without reaching for it. A comic-strip style is generally maintained for the illustrations inside. The dimensions of the boxes are pleasantly varied, as is the number of pictures on each page. This style perfectly sets the pace for the story. Readers are also treated to breathtaking double-paged spreads, allowing space to pause, reflect and empathise. I was reminded of Anna Walker’s Mr Huff when I first started reading this, but in premise only. The illustrations in this book are extraordinarily lifelike and much darker, intended for an older age group – perhaps upper primary to early secondary. This book is hauntingly beautiful in its own right, more so because the author took her own life before she was able to complete it. Her family collaborated with award-winning artist Shaun Tan to piece the story together, thus producing an insightful window into mental health awareness. Shaun has contributed the final three illustrations in the book. They show the character understanding that he is not alone in his worries, that such feelings are universal and that reaching out to people is the only way to keep the demons at a distance.